ISBN: 9781472422903. Ashgate Publishing Group, Hardback, 232 pages, £65. Erik Champion's Critical Gaming: Interactive History and Virtual Heritage is an intriguing and rapidly moving examination of many questions – what are digital humanities, what is the importance of dissemination of research outside academe, how can we best present the cultures and practices of other societies in virtual spaces and, most importantly, what is (or what might be) the role of games and play in these endeavours? The book often flits back and forth between a number of interrelated concerns related to these core topics, and therefore this review will not seek to cover every topic the book addresses, but rather to provide a broad overview of the substantive topics, the order in which they are covered and the relationships between them, and to question some of the bolder and most noteworthy claims it puts forward. Champion begins by exploring the current dominance of textual research and output in the field of digital humanities – which he defines as a fusion of computing and humanities with neither given obvious priority over the other (page 5). He argues that since many find images more compelling and easier to understand than text (10-11), visualisation methods would augment (17) textual approaches thus leading to broader dissemination, as well as allowing for an appropriate portrayal of societies with strong visual and symbolic cultures, such as the Maya. This first chapter then concludes by fleetingly raising the possibility of using computer games in the digital humanities as a method of creating valuable visualisation systems, which leads onto the second chapter's discussion of the nature of 'games' and whether existing work is illustrative, or inadequate, when it comes to games with a digital heritage or historical simulation agenda. Champion challenges (29-30) the view of games as fundamentally rule-based systems (Juul 2011), proposing that this doesn't fully describe the subjective and phenomenological experience of a player – especially as the player most probably won't even appreciate all the rules that are being calculated beneath the surface of a game. In this chapter the author also proposes that the best games are 'thought-provoking' (34-35) – highly relevant to the educational agenda at work – and for a level of indeterminacy in the rules and affordances of games, arguing that the designer-implemented rules are not necessarily the only rules by which a game is played (36-37). This echoes much recent work into the examination of glitches, modding, speedrunning, and other subversive practices of counteractive design (Johnson and Reed forthcoming) or what Bjögvinsson et al. (2012) would call 'design-after-design'. He also argues against the prevailing assumption in game studies that specifically computer games are the most important form (29), suggesting that games should be assessed – in the context of learning – for their 'value' and pedagogic potential rather than their media form. This chapter concludes with three historical game case studies, and in doing so makes a final intriguing challenge to the primacy of rules in understanding games. Champion argues that in a museum or gallery setting, people have less time for repetition and consequently a reduced ability to master a complex set of rules (55), and this should be borne in mind when creating historical simulations or heritage games, which instead should focus upon understanding cultures, languages or ways of life. The third chapter focuses on an examination of 'Virtual Reality', currently one of the most talked-about concepts in game studies and the games industry. This takes the form partly of a detailed critique, arguing that social connectedness inherent in most forms of gameplay is lost (or at least severely reduced) in VR environments (72) and that there are significant 'infrastructure' issues in the development and dissemination of VR equipment (69), but nevertheless remains hopeful (62, 72) about the potential for community-led or collaborative endeavours to significantly broaden the impact and relevance of VR beyond its current boundaries. The chapter (as with many others) also considers a range of case studies from different projects and gives a thorough and detailed summary of the field of VR – specifically in the case of historical or pedagogic simulations – as it currently stands. This leads on to Chapter 4's closer examination of historical simulations, raising in the process a number of highly interesting theoretical points in a move away from the more empirical leanings of the previous chapter. On page 77 Champion makes an intriguing suggestion that historical simulations to date have tended to be 'step-based' – one technology led to another – rather than 'rule-based', which would examine the conditions and social and technical constraints that defined or delimited the range of possible outcomes of a historical scenario, one of which happened to be the outcome that actually occurred in real-world history. Games tend to avoid complex interactive 'ecosystems' and give us instead something much simpler (78) – and yet, many true simulations would be rather dull (79) and inevitably focus on the everyday minutiae of life. How could games resolve this issue? On page 82, he answers some of these questions by proposing three ways that games can be effectively used to understand history, only one of which actually necessarily needs such complex simulations: they can be played discursively to 'play and answer questions' in a discussion-focused group environment; performatively by role-playing as certain characters in certain sociohistorical contexts; and as what he terms thesis-based kitset visualization machines, that allow hypotheses about historical developments to be tested and changed in a detailed simulationist environment. To build upon the second of these further, towards the end of his chapter he develops the compelling idea of cultural presence, 'a feeling in a virtual environment that people with a different cultural perspective occupy or have occupied that virtual environment as a "place"' (85), as a method for describing the feeling that historical and heritage games should seek to inspire in the player. Chapter 5 has an intriguing discussion of cultural geography and the understanding that culture, in many cases, is what is not seen, and therefore how can culture be represented in what is a primarily visual medium (95-6)? This requires (as described above) the creation of simulations that focus on process rather than outcome, and he thereby argues that games of digital heritage should show how contested knowledge is constructed (103) instead of simply showing the concepts or beliefs that 'won' and were inscribed into the historical record as maters of fact (117). We need to see how people interact with a building or behave with each other, rather than witnessing a step-by-step process towards the endpoint of the present day (or some other pre-modern historical point). At the same time, it is worth noting that despite this call for greater engagement in what UNESCO would term the 'intangible' cultural heritage of a society, in general the book does display a certain emphasis upon the reproduction and dissemination of physical artefacts and buildings. However, given the challenging questions about the non-physical nature of many cultural practices and creations, and games as a primarily visual medium, this is not necessarily a criticism, but itself actually further highlights the difficulty in conveying other forms of historical culture in any kind of environment, virtual or otherwise, as the overwhelming majority of case studies are focused around space, place, and the creation of the sense of virtual embodiment. The sixth chapter explores role-playing and ritual in both the virtual and the real world, returning to the idea of cultural presence to look closely at the degree of role-playing actually possible in most mainstream games. To do this he examines the game The Elder Scrolls: Oblivion, noting that the 'books' within the game world (in actuality, short passages of text written by the game developers) speak to many forms of interaction and many kinds of events and behaviour that are impossible given the technical constraints of the game itself, making the game's 'background' fiction significantly richer than the fiction that the player is actually able to create themselves during the act of play. This chapter also includes an extended and compelling analysis of the creation and renewal of traditions in the process of role-play that is beyond the scope of this review to summarise adequately, arguing that virtual worlds designed with heritage objectives in mind should seek to enable freedom of choice rather than inevitable steps towards a known end, the 'social jockeying of position' and the potential for fluidity in social roles, as well as the ability to continue to 'carry forward' the goals, ideas and concepts of a society through role-play (148). This argument for virtual role-playing as a method for the preservation of cultural heritage is one of the most original and intriguing parts of the book, and a potentially highly valuable model both for engaging the public and maintaining intangible cultural heritage. To begin chapter 7, drawing on Juul's emphasis on games as cultural artefacts, Champion adds to this concept by suggesting games can also be acultural – transient, passing things with little impact beyond themselves – and potentially anti-cultural, if they are particularly escapist and thereby 'waste time', seek to undermine and subvert public institutions or social norms, or are unaltered by their passage through society by 'resist[ing] enculturation' (153). This anti-cultural category is particularly intriguing, but I am inclined to say that it should perhaps should be split into several categories instead of just one – pure time-wasting might indeed be anti-cultural in the sense that Champion suggests, but the other two are more problematic. I would propose that Champion's second category of anti-cultural should surely be termed 'counter-cultural'. A game that attacks a dominant cultural norm or expectation is not anti-cultural in the sense that, as the term suggests, it attacks all culture (which perhaps pure time-wasting does) and is 'anti' the concept of culture per se, but rather proposes different cultural norms that do not treat the important concepts and individuals of our culture with the same level of reverence we (traditionally) think they deserve. Similarly, although it is an interesting claim that a game that is unaltered by its use compared to an ancient book, for example, whose pages are worn by the passage of time and tell something of a story of its past use (153), I am not sure how well this claim holds up to scrutiny. Individual copies of games can be altered by modification or 'mods', individuals will inscribe their names on the high-score list of an arcade console, a shared cartridge (from older consoles) brings with it the legacy of the in-game achievements of the previous player, games with unlockables are marked by the progress of their player and the new affordances accessed, individuals can become notorious or noteworthy within the interconnected worlds of MMOs (Massively Multiplayer Online games with millions of players existing in the same game universe) and in the process come to permanently 'mark' the game, especially in games like EVE Online. Similarly, the passage of culture and technology outside the artefact of the game itself brings new meaning to a CD-ROM that now requires specialist technology to play, or the cartridge for an old games console that requires a specific model of monitor to run, or the floppy disk containing a game that can only nowadays run in an emulation of MS-DOS. I think this one-page discussion offers something extremely rich, but I am not convinced that games pass through culture (or can pass through culture) in as transient a manner as Champion suggests, nor that seeking to subvert the dominant culture in which the game exists should accurately be termed 'anti-cultural'. The book's discussion of these interesting ideas seems too fleeting and brief, and would merit development in the future beyond the three categories I've proposed in this review. Aside from this, Chapter 7's focus is otherwise on the problem of the ubiquity of violence in the historical record (155), and whether or not this should be present in historical simulations designed, at least in part, for children; towards the end of the chapter he proposes a number of alternatives to violence (160) in games, including the intriguing suggestions of encouraging NPCs (Non-Player Characters i.e. AI-controlled in-game actors) to disparage the player who pursues their objectives through violent means, and the challenging task of adding a sense of moral accountability to gameplay (162). The first of the final three chapters concerns the creation of compelling Artificial Intelligence (AI) actors who can act as convincing 'cultural agents', and Champion develops the idea of a 'cultural Turing Test' (177) by which the player might be tasked with blending in with a given culture and accurately and appropriately presenting themselves as belonging to that culture. Although I was not aware of it when I volunteered for this book review, this objective is remarkably close to the objectives in my own game design work (Johnson 2015), and I also think that the development of games that can portray cultural practices, and assess the player's ability to accurately echo those cultural practices, could be immensely valuable. It also inevitably reminds one of games like Spy Party, where the player is tasked with 'blending in' and behaving like an AI actor, in order to prevent another player from detecting who is the first player and who is merely an AI. The penultimate chapter considers the potential value of biofeedback and whether space and place can be understood as semi-physical experiences, rather than just objects and areas in a virtual world. He suggests that biofeedback could reward or punish players based on their calmness, or incorporate gaze tracking to reward concentration on challenges, or have other events occur if the player becomes distracted (201). He describes how a high heart-rate could assist agility and a low galvanic skin response with accuracy in aiming weapons (191), and that such additions could be highly valuable in evoking a more profound embodiment beyond mere physical location. The final chapter then summarises the themes of the book. 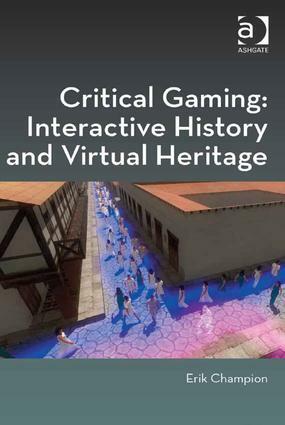 This book covers a significant range of questions and clearly aims at a greater integration between digital humanities and game studies and game design than has hitherto been achieved. It examines the creation of culturally rich AI actors and culturally rich spaces, the potential for achieving a greater sense of embodiment and presence within these spaces, concerns over game violence, the potential (or not) of VR, and throughout offers a detailed and clearly very up-to-date appraisal of the field as it currently stands. With that said, this willingness to flit between a range of topics, empirical and theoretical, and between digital humanities, game studies, archaeology and virtual reality, seems to me both the greatest strength and the greatest weakness of the work. At times it read as an 'exploration' of a range of interconnected issues just as much as a concentrated 'argument', although the overall claim that digital humanities and digital heritage could have much to learn from games, and potentially vice versa, is clear. In doing so, the book proposes a number of intriguing and provocative suggestions, relating to both our theoretical understanding of games and in giving more empirical recommendations for the future of heritage- or simulation-focused gaming experiences, and lays the groundwork for potentially fascinating developments in coming decades. Juul, J. 2011 Half-Real: Video Games between Real Rules and Fictional Worlds, Cambridge MA: MIT Press.